The inaugural British Takeaway Awards last night crowned Cardiff’s Wiwo Noodle bar as the best takeaway restaurant in Wales beating off competition from Indians, fish and chip shops and kebab houses. In a lavish ceremony at London’s Savoy Hotel, hosted by TV couple Tess Daly and Vernon Kay, the modern Chinese in Cathays came top in a national vote of more than 100,000 customers in the competition supported by JUST EAT, the online ordering service. The noodle bar, run by Kash Munir and his brother, offers a “modern twist on Chinese food” and prides itself on being customer focused. Mr Munir said: “As a company we thrive on our customers reviews and feedback and are strong believers that we are where we are today because of them. JUST EAT, the award’s lead supporter, also welcomed celebrity takeaway fans to the event to see first hand who would be crowned top of the takeaways included Celebrity Masterchef favourite Millie Mackintosh, Donna Air, and TV Chef Ainsley Harriott, who tucked into slow roasted beef fillet followed by pistachio panacotta. Husband wife team Tess and Vernon, who admit they are no strangers to a curry, presented the awards which were attended by more than 250 takeaway owners from around the country. Other worthy regional winners included the North East Retro Sweet Shop in Darlington, the first ever UK takeaway service to deliver American candy and Oreo Milkshakes to homes, with 85% of the shortlisted takeaway restaurants being available to order online through JUST EAT. In total, 14 awards were presented; made up of 13 regional awards for the best loved takeaway restaurants locally and the overall winner. The overall winner was Chris’s Fish and Chip shop in the village of Barwell, just outside Leicester. 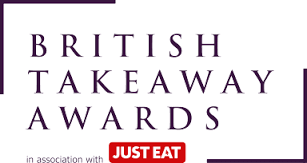 The first ever multi-cuisine takeaway awards launched as the nation’s leading takeaway service, JUST EAT, found that the UK takeaway industry is worth £9 billion to the UK economy. Total employment in the takeaway industry rose by 10% from 2012 to 2014 and by nearly 17% over the past five years, mirroring the wider growth the sector has seen. The takeaway industry in Wales injects £420m into the economy, generating 12,400 jobs.